Since its development in the 1940s, intraosseous (IO) access has been a mainstay of resuscitation in both pediatric and adult patients. IO access has been used in medical emergencies requiring immediate access when peripheral IV access is either not possible or time-prohibiting, such as cardiac arrest, status epilepticus, shock, trauma, and burns. There is mounting evidence supporting the continued use of IO lines both in-hospital and pre-hospital. Studies have demonstrated similar outcomes between IO and IV access with return of spontaneous circulation, further supporting their use during cardiac arrest3. In fact, the International Liaison Committee on Resuscitation (ILCOR) stated in 2010 that “Delivery of drugs via an endotracheal tube is no longer recommended – if IV access cannot be achieved, drugs should be given by the IO route”. Currently, IO access is achievable in two ways: manually or with commercially-available drill-inserted devices (such as the EZ-IO). Why use an IO instead of a central line during a resuscitation? Besides the obvious advantage that IO insertion is quicker, it is also cheaper than central line insertion. On average IO lines cost about $100 compared to $300 for central lines. Additionally, there are far fewer complications associated with IO lines compared to central lines. All medications that can be given via central line can also be given via IO line. Blood can be drawn and sent for lab analysis just as with IV access. Although an IO line only has one lumen, there are multiple possible insertion sites, and multiple IO lines can be placed in the same patient simultaneously. Furthermore, IO lines are easy to remove when more definitive vascular access has been obtained. But perhaps one of the biggest advantages of an IO is that it requires less training and experience to insert than a central line. Their ease of use allows trained RNs, techs, and novice providers to obtain vascular access without interrupting assessment by senior providers. In fact, a recent study showed that IO access can effectively be taught as a four-step approach to medical students. There are a few important contraindications to IO access for the EM physician to be aware of. The first is any fracture at or proximal to the insertion site, as this can cause extravasation of fluids or medication and increases the risk of compartment syndrome. The second is cellulitis or evidence of other infection such as abscess at the insertion site, similar to other procedures like central lines and PIV access. Sites of prior attempts should not be used for a second attempt. Lastly, patients at risk for fracture (for instance, osteogenesis imperfecta or osteopetrosis) should not be given an IO line. Although manual insertion of an IO line is possible using a Cook or Jamshidi needle, commercial devices such as the EZ-IO are widely available and should always be used for IO insertion if available. 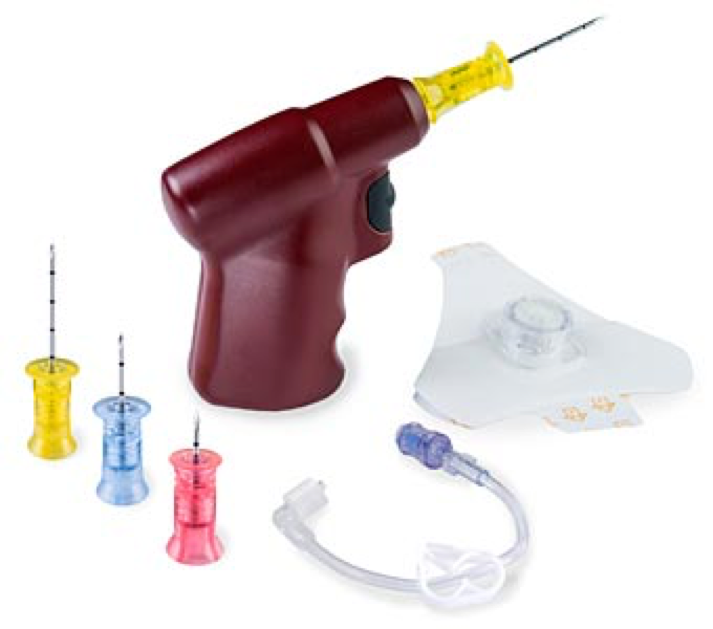 The EZ-IO kit includes the IO needle set (with 45 mm, 25 mm, and 15 mm needles), power driver, IO tubing, and adhesive dressing as shown in the image below. The 25 mm needle is the standard needled used for adults. If the humerus is used or there is excessive tissue (i.e. muscular or obese patients), then the 45 mm needle should be used. The 15 mm is generally used in children or any adults <40 kg. Of note, this is the preferred insertion site during resuscitation, especially those involving abdominal trauma, as medications and fluids enter the circulation faster as they reach the central circulation via the SVC and bypass the pelvic and abdominal vessels. After choosing the correct needle and site, clean the site with alcohol swabs or chlorhexidine, and connect the needle set to the power driver (i.e. the drill). Remove the needle cap and insert the needle by drilling with a consistent downward pressure perpendicular to the bone surface. It is customary to feel a sudden loss of resistance, as the needle “gives” when entering the medullary space. Remove the power driver from the needle and secure the site with the adhesive dressing. At this point, you can aspirate blood for lab analysis and then connect primed IO tubing to flush the IO line. Now the line is ready for use to primed IV tubing. Make sure to document the time of insertion as IO lines should not be left in for more than 24 hours. Any medication that can be given intravenously can also be given intraosseously. This includes contrast media and blood transfusions. Some amount of hemolysis of transfused blood has been documented when given intraosseously, although this is of unclear clinical significance. According to multiple studies, the IO route is pharmacokinetically equivalent to the IV route and therefore there is no need to change medication doses when administering via IO8. While any lab can be sent from an IO blood sample, it is important to be cognizant of the correlation between certain labs when obtained via IO vs IV. Labs that have good correlation include hemoglobin/hematocrit, chloride, glucose, urea, creatinine, and albumin. However, other labs including WBC, platelets, serum CO2, sodium, potassium, calcium do not correlate well or in any predictable way with venous samples4. All IO lines should be removed within 24 hours of the insertion time or earlier if there is any sign of extravasation (i.e. progressive pain or swelling at the insertion site). After disconnecting all infusions, the EZ-IO needle and hub can be removed by attaching a 10 cc luer-locked syringe to the hub and rotating clockwise while pulling back. As with all potential sharps, the device should be disposed of in a biohazard sharps container. Although rare, there are several complications of IO access to be aware of. These include osteomyelitis, fracture, extravasation, compartment syndrome, and necrosis of the epiphyseal plate. However, perhaps the most common complication is injury to self or others while obtaining access. To avoid injury, warn conscious patients about the procedure and in unconscious patients make sure to stabilize the site. IO lines are a mainstay of resuscitation and used when peripheral IV access is either not possible or time-intensive. Compared to central access in resuscitations, IO access is cheaper, quicker, safer, and easier to obtain. Contraindications to IO insertion include fracture at or proximal to the insertion site, cellulitis or other infection overlying the insertion site, prior attempt at the insertion site, or bone disease such as osteogenesis imperfecta or osteopetrosis. Make sure to choose the appropriate needle and insertion site prior to obtaining IO access. All medications that can be given intravenously can be given intraosseously at the same doses. Remember that not all lab values from an IO sample correlate with IV samples. Accurate IO labs include: hemoglobin/hematocrit, chloride, glucose, urea, creatinine, and albumin. IO lines should be removed within 24 hours of insertion. Complications are rare but include osteomyelitis, fracture, extravasation, compartment syndrome, and necrosis of the epiphyseal plate. Intraosseous lines in the emergency department have always made perfect sense to me so I appreciate the scrappy enthusiasm for them in this article. In my opinion, they are an incredibly logical alternative to “crash” central lines. I mean, seriously, in a scenario where a patient is coding or about to code, why in god’s name should we be farting around with a femoral line? People get stuck with needles. Arteries are inadvertently punctured. There’s a huge mess and it’s often not sterile. An IO goes in clean and easy within seconds and boom, you’ve got yourself access, and essentially central access at that. You can put pretty much anything in it, although I did hear in my time around the ICU circuit in residency that the exception to this is TPN. That’s largely a piece of meaningless chin stroking trivia but, hey, maybe it will make you sound smarter on MICU rounds tomorrow AM. The needle sizes can be a bit confusing in a tense situation. To avoid any issues, just remember this to keep it simple: USE THE BLUE NEEDLE. I have yet to have a patient who was so obese they needed the yellow needle in their tibia, and the pink one is exclusively just for kids. The best route is indeed via the humerus as the flow rate is reportedly as good as a subclavian line. Folks tend to jump for the tibia as their go-to site, and that’s perfectly fine but if you’re doing this out of uncertainty with the landmarks of the humerus it’s easier than you think. One way I was taught was to place your hands in an inverted “V” over the proximal humerus, and where your thumbs meet over the bone there is your target for your drill. Not to be a Robert Downer Junior but I should remind everyone that there was an article in Annals this year entitled “Intraosseous Vascular Access Is Associated With Lower Survival and Neurologic Recovery Among Patients With Out-of-Hospital Arrest.” The title really states it all, showing a lower rate of “favorable” modified Rankin score in the patients that got IO over IV. Another study from Resuscitation last year titled “Intraosseous compared to intravenous drug resuscitation in out-of-hospital cardiac arrest” also showed decreased rates of ROSC and survival to hospitalization (but not to discharge) in the IO group. Bear in mind the IO’s in these articles are placed in the field and not in the hospital, although I can’t think there’s too much difference in technique between us and our friends out in the rigs. I’m not going to get into the nitty gritty of each of these papers and I certainly don’t think we are actively making moves to remove them from our practice in our specialty but keep your eyes open for more discussion and research on this in the coming months to years. I still like the IO and it’s still a part of my practice and I encourage you to use it as well. Drill, baby, drill! Foëx, B.A. (2000). Discovery of the intraosseous route for fluid administration. J Accid Emerg Med, 17(2) 136-137. Faga, M., & Wolfe, B. (2016). Vascular access in hospitalized patients. Hospital Medicine Clinics, 5(1), 1-16. Clemency, B., Tanaka, K., May, P., Innes, J., Zagroba, S., Blaszak, J., Hostler, D., Cooney, D., McGee, K., & Lindstrom, H. (2017). Intravenous vs. intraosseous access and return of spontaneous circulation during out of hospital cardiac arrest. Am J Emerg Med , 35(2), 222-226. Afzali, M., Kvisselgaard, A.D., Lyngeraa, T.S., & Viggers, S. (2017). Intraosseous access can be taught to medical students using the four-step approach. BMC Med Educ, 17(1), 50. Winkler, M., Talley, C., Woodward, C., Kingsbury, A., Appiah, F., Elbelasi, H., Landwher, K., Li, X., & Fleischmann, D. (2017). The use of intraosseous needles for injection of contrast media for computed tomographic angiography of the thoracic aorta. J Cardiovasc Comput Tomogr, 11(3), 203-207. Posted on February 25, 2019 by NUEM Blog and filed under Procedures and tagged IO intraosseous IV access IV. We’re all familiar with the “difficult access” patient: the nurses have tried all possible traditional peripheral routes, both ultrasound-guided and not, the resident has been in with the ultrasound and had no better luck, the EJ blew a few minutes after it was placed. The choices you seem to be left with are intraosseous access (certainly useful in an actual emergent situation, although having a spike drilled into their long bones is not something that most awake and alert patients are thrilled about) or gain central access via a central venous catheter (again, useful and appropriate in some circumstances, but poses increased risk for complications). Ultrasound-guided placement of a standard single-lumen angiocatheter into the internal jugular vein. Accessing the IJ with a peripheral venous catheter was first described in a 2009 letter to the editor in the Journal of Emergency medicine. Only a few studies were subsequently published between 2009 and 2016 regarding the procedure’s technique, its safety, or its efficacy. The few small case series that were published studied 37 patients in total; in all series, the procedure was noted to have a high success rate and on average took significantly less time than placing a central IJ catheter. [5,6,7] The past year has seen two additional prospective studies evaluating both the efficacy and the safety of the peripheral IJ, enrolling a total of 107 patients. [2,3] The first study noted no complications at 1 and 6 weeks associated with US-guided peripheral IJ catheterization. The second, a multicenter study, noted an 88% success rate and a 14% complication rate (the only complication being lost patency—of note, it is unclear whether or not this was considered a complication in the first study). In all studies, the time to insert the peripheral IJ was approximately 5 minutes or less. While the body of literature thus far is still relatively small, it would seem to suggest that the use of a peripheral IJ is a safe and suitable alternative in appropriately selected patients who have no other feasible routes of vascular access, and in whom the insertion of an IO or central line is otherwise unnecessary. The placement of a peripheral IV into the internal jugular vein under ultrasound guidance has been described as efficacious and safe. On average, it is not a time-consuming procedure. This is operator-dependent, but it takes significantly less time than placing a central venous catheter in most cases and is associated with fewer complications. The rare but classic case remains the difficult vascular access patient with severe shortness of breath. Using either the long angiocatheter in the central line kit, and today a long peripheral intravenous catheter, an experienced clinician sonographer may be able to insert the catheter with the patient nearly upright. In such patients, either an infraclavicular subclavian or supraclavicular subclavian central line approach may result in a pneumothorax, quickly turning a bad situation into a nightmare for everyone. Instead, quickly placing a simple long peripheral catheter into the IJ using US guidance immediately establishes the vascular access needed to administer life saving medications. When the patient is stabilized, the traditional central line may then be placed if still required. Necessity breeds invention! So it is exciting for new and experienced clinicians alike to now be able simply use the long peripheral IV catheter in both stable patients not needing central access, and the rare unstable patients who must remain upright, and only opening an expensive central line kit when needed. Butterfield M, Abdelghani R, Mohamad M, Limsuwat C, Kheir F. “Using Ultrasound-Guided Peripheral Catheterization of the Internal Jugular Vein in Patients With Difficult Peripheral Access.” Am J Ther. 2015 Oct 8. Posted on August 27, 2018 by NUEM Blog and filed under Procedures and tagged ultrasound IJ catheter.